Windguru deckt jetzt die meisten Teile Europas mit WRF 9 km Auflösung ab! Diese wichtige Aktualisierung wäre ohne die Unterstützung unserer PRO-Benutzer nicht möglich gewesen. Vielen Dank! In den letzten Tagen waren einige Schwierigkeiten mit WRF Vorhersagen. Entschuldigt uns bitte dafür. Alle Abonnenten erhalten eine kostenlose 2 Wochen Verlängerung als eine kleine Wiedergutmachung. WAP2 Vorhersagen können jetzt auch die neuen Parameter (relative Luftfeuchtigkeit, Luftdruck auf Meereshöhe und Frostpunkthöhe) zeigen. Die Einstellungen für Vorhersagen für Webseiten sind jetzt mehr detailliert. Windguru auf dem iPhone. Viele von Euch hatten danach gefragt, endlich ist er da! Die App kann direkt auf Dein iPhone heruntergeladen und installiert werden, oder über iTunes - in der Wetter-Kategorie des App Store. Sie ist KOSTENLOS! Der Winter kommt nach Europa. Viele Leute wächseln von Kitesurfing auf Snowkiting. Viele suchen nach Frosttemparaturen und Schneegrenzen. Diese Einstellmöglichkeiten gibt jetzt auch. Unser Mittelmeer WRF 9 km Gebiet wurde weiter erweitert, jetzt deckt es auch Griechenland, die ganze Ägäis, West Türkei und westliche Teile vom Schwarzen Meer ab. Viel Spaß! Windguru in Russisch! Die russische Version wurde übersetzt von Victor Yegorov - email: . Windguru in Schwedisch! Die schwedische Version wurde übersetzt von Mikael Gustafsson & Magnus Markling. WRF 27 km Domänen für Nord und Süd wurden erweitert. Windguru in Rumänisch! Die rumänische Version ist übersetzt von Sebastian Enache - e-mail: . Windguru in Estnisch! Die estonische Version ist übersetzt von Tarmo Tanilsoo - email: . Windguru in Niederländisch! Die holländische Version ist übersetzt von Harco-Jan (surfpro.nl) and Jan Marques - email: , www: www.mijnbb.be - Gratis Forum. Windguru in Galizisch! Die galizische Version ist überzetzt von Antonio Alvarez. Alle hochauflösenden Vorhersagen für Europa basieren jetzt auf WRF Modell. Wir behalten die früheren MM5 Vorhersagen, aber sie werden später abgeschalten. NAM 12 km Vorhersagen für Nord Amerika wurden auf 84 Stunden erweitert. WRF 9km Bereich ist in östlicher Richtung erweitert, jetzt ist das ganze westliche Mittelmeer einschließlich Italien und das adriatische Meer abgedeckt! Um die besten Spots von einem Monat zu finden, haben wir Top spots in den Archiv hinzugefügt. Vom Donnerstag 26. April bis Samstag 2. Mai waren die WRF 9 km Vorhersagen nicht abrufbar. Weil das ein längerer Ausfall war, hat Windguru alle Abos um zwei Wochen verlängert. Wir entschuldigen diese Unannehmlichkeit und hoffen, dass dir dieser kleine Ausgleich gefällt. Windböen und gesamt Bewölkung zu WRF-Modell Vorhersage hinzugefügt. NAM-Modell Vorhersagen beinhalten jetzt auch die Windböen. Click-Map Vorhersagen. Möchtest du Vorhersagen für jedes Ort auf der Erde sofort sehen? Es war noch nie so einfach... :-) Wähle einfach ein Ort auf der Karte und du bekommst die Vorhersage. Nur für PRO-Benutzer. Windguru in Portugiesisch! Die portugisische Version ist übersetzt von Armando José Laborinho / Clube Naval da Nazaré. Windguru in Lithuanisch! Die lithuanische Version ist übersetzt von Girmantas Neniskis (www.extreme-sports.lt). Windguru in Ungarisch und Deutsch! Die ungarische Version ist übersetzt von Péter Szántó - email: , www: peter.szantocsalad.hu. Die deutsche Version ist übersetzt von Murat Tüten - email: , www: www.dwsv.net. Windguru in Französisch! Die französische Version ist übersetzt von Bernard Laforgue. Windguru in Spanisch!. Die spanische Version ist übersetzt von Ibon Maza - email: , www: www.gnshore.tv. Benutze die kleine Flagge im Hauptmenu um die Sprache zu wechseln. Für Windguru PRO-Abonnements akzeptieren wir jetzt auch Moneybookers oder Paypal als alternative Zahlungsmethoden. Mehr Information über Zahlungsmethoden. Mehr Information auf den Hilfeseiten. Jetzt kannst Du die Windmodifikationen mit anderen Benutzern teilen. Du kannst verschiedene Modifikationen für eine Vorhersage haben und zwischen ihnen in der Vorhersagetabelle wechseln. Mehr Information auf den Hilfeseiten. MM5 9 km Vorhersagekarten (für Windguru PRO-Benutzer) sind in einstündigen Schritten verfügbar. MM5 27 km Karten sind jetzt auch in einstündigen Schritten verfügbar. 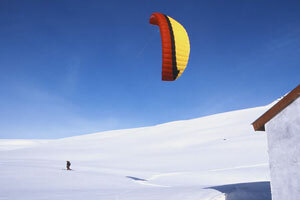 Winguru supports Pakistan Kite & Flight 2006, a very unique expedition to the Deosai Plains in the Himalayas. Bringing together some of the highest calibre freestyle ski and snowboarders with an elite team of Snow Kiters, in March this year, the event concept was conceived by Walkabout Films and is driven by Ozone kites. Promising to be the first of its kind, Big Air demonstrations and Snow Kiting at record breaking altitudes, all the riders will trek and snowshoe up to 4200m, where they make base camp for a week. Professional photographers and cameramen will be capturing the action. Czech kiter Murphy from Mushow gang is a member of the team. For more information on this event, full list of riders and sponsors, and images from 2005 trip, please visit the organisers website www.pakistanfreeride.com. Current GFS based forecast for Pakistan - Deosai Plains on windguru. 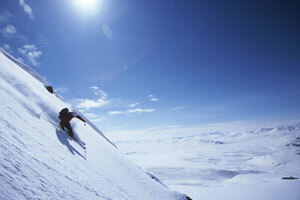 Windguru.cz wishes good luck and the best weather! Added more MM5 9 km high resolution forecast data! New MM5 9 km domain covers southern UK, La Manche Channel, north-west part of France, Belgium and west part of Netherlands. We decided for this area because our statistics say it's one of the most popular. One more reason to go for the PRO version. Enjoy! The main spot menu got quite long over time so it's time to make it more transparent. Now the spots are organised by country and some also by region. Thanks to cooperation with Stoked Publications and their superior KITE AND WINDSURFING GUIDE EUROPE we now have over 1500 more European spots in the main windguru spot list! All the spots in the guide are covered by windguru forecasts. The spots in the Stoked guide are organized by regions, I used their regions as a starting point but of course we can add more as people suggest. One spot can belong to more regions. Choose "ALL" in the region menu if you are not sure where to look for some spot. 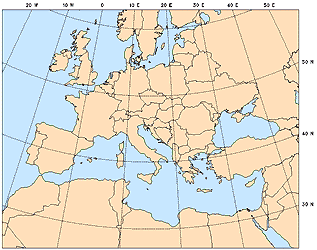 At the moment we have regions in several European countries only, others do not have them yet. Dear windguru users, I'd like to ask you for a little help, if you have an idea about ideal regions for other countries please tell me and I will be happy to add them. As you can see the main navigation panel looks different, now we use tabs to switch from the spot menu to favourites or spot search etc.. The wind and temperature units and forecasts hours menu was moved to Option tab. Hope you like the new panel. Any spot can now be assigned to spot "category". Not just windsurfers and kitesurfers use windguru, for example paragliders have their own spots and they are not interested in others. Now it's possible to view for example only paragliding spots, just click the "Select spot categories" and use the checkboxes to filter some categories only. Again, this is a new feature, for the beginning I have marked all spots windsurfing & kitesurfing, feel free to report errors. Please, go to your settings and enter right categories for your custom spots. Available categories: windsurfing, kitesurfing, snowkiting, surfing, paragliding, yachting, balooning (but we can add some more). Of course sometimes it's not easy to choose the right categories for some spot. For example, theoretically you can kitesurf anywhere where there is some water, even in the middle of the ocean but we should not mark a spot as kitesurfing unless it is really used for kitesurfing. Hope you understand what I mean, please use common sense when choosing categories. Windguru forecasts for your website available. Now you can configure and display GFS / NWW3 based forecasts directly on your webpage. This service is free. Read more in Help/FAQ. Added .kmz files for Google Earth. Using this you can import the list of Windguru spots to this great program to see where they are located. If you have not heard about Google Earth yet look at earth.google.com, it is one of the best applications I have ever seen. The basic client program is available for free. Google Earth is a trademark of Google Inc.
Added NAM model forecasts! (The North American Mesoscale model) NAM produces short term forecasts covering Northern America with 12 km average resolution. See the coverage map in help/FAQ section. It is a new option in your user settings (see Settings -> User - 3) Preferences -> Login). If you enable automatic login and if you do not manually logout when leaving the site, you will not need to manually login when you come back to windguru next time, you will get directly into the green login mode, so you can immediatelly enter your settings area without verifying your password, post not anonymous messages to the forum, PRO users can instantly see their full MM5 forecasts etc... Autologin is arranged using a secure cookie and it will work in maximum 3 computers/browsers. If you manually logout, you will not login automatically next time. Warning! Use at your own risk! Use the autologin feature only on your personal / home computers or notebook... If you are in internet cafe, or anytime when you use computer which other people can use too always manually logout using the [Logout] link ! Otherwise unauthorized people can change your personal settings, alter your forecasts etc..
Windguru started cooperation with german Surf magazine, one of the leading windsurfing magazines in the world. Surf website now offers wind forecasts powered by windguru using nearly 100 direct links to windguru.cz forecasts. Surf magazine came out first in 1977, since then, it brings you all the info about windsurfing - travell tips and spotguides, equipment tests, technique, news from the world of windsurfing and many more. Surf comes out 10 times per year in german language. WAP pages updated. Now it is possible to search any spot and view it's forecasts, and it is also possible to use WAP without login. Do you want to know where to catch the best wind for this weekend? Check it out at Top forecasts. Tide predictions based on XTide. All weather forecast tables for spots which are less then 100 km away from some XTide location now have a "Tides" link. Wave forecasts by NWW3 model are now possible for custom spots too. If you want to enable this for your spots go to your settings and edit your custom spots, you will find out more there. 1) Beginning today Windguru is available in two versions: free and PRO version. Most forecasts and website features stay free, but full and unlimited access to everything requires a small subscription fee. This website was always absolutelly free so why this change? Running this web is not free. The new MM5 data, hardware, internet connection and site developement cost money. Small subscription fees can help to fund the site, keep it online and make it better and better. Hope you understand... More information about difference between FREE and PRO version. 2) Also added a feature of creating list of favourite locations to the settings, these then appear in a special menu on the main page for quick access. It is possible to put ANY spot available to the favourites including any user's custom spot (if that user have not marked his custom spot as private). Hope this feature helps to users who got used to viewing other people's forecasts but now they can't login to any user without password. Now you can search any spot, add it to favourites and then also add it to your forecast set.. This will not be the last function of favourite spots, more features coming soon. A little change for higher security. It is no longer possible to login without entering your password. As for automatic user recognition using cookies, it will work the same way as before. If Windguru did not recognize you now, just login again and it should recognize you again next time. New windguru logo :) You can download a bigger image here. MM5 27 km archive and MM5 9 km archive now available. Updated Help/FAQ page with some more info about GFS and MM5 models. Now it is possible to select individual combinations of spot and model in Settings / Forecast sets (up to 20 forecast tables for one set). Editing wind modifications for MM5 forecasts available. MM5 forecast with 27 km resolution is now available for nearly all Europe and Mediterranean sea! WAP now includes wave (NWW3) forecast and MM5 (experimantal) forecasts if available. The timezones were updated, now it is possible to set the right timezone for every spot (not just GMT hour offset). I have updated the timezones for all the spots on the main list, if you see some error please tell me. You should adjust the timezones for your custom spots, otherwise the daylight savings time will not apply correctly. Added sunrise and sunset times. Short windguru survey. Please participate, it will help to make windguru better! Added peak wave period (seconds) to NWW3 forecasts. Added french Help/FAQ page translation. Thanks to Saucisseman! Added quick search for the spotlist. Just type a piece of a spot name to the search field and the spotlist will show only the corresponding locations. Up to 180 hours (7.5 days) GFS forecasts are now available. Just a little change... AVN model was renamed to GFS (Global Forecast System). It in fact happened last year when NCEP combined their MRF and AVN models into one system and renamed it to GFS. Archived data for spots on the main list! Data available since 16.3.2003 (except spots which were added later to the list...) I hope that later I'll add some data statistics and comparison too. Many people asked me recently if it's possible to make a link from their website to a specific forecast on WindGURU. Now you can use this tool to generate the right link. Wave forecast available for selected spots! (most ocean spots). It's based on NOAA Wave Watch 3 model, forecast updates 4 times per day. The data displayed inside the AVN forecast table are "Significant wave height" (in meters) and "Peak wave direction". Right now the wave forecast is only available for spots on the main list and not for custom spots, but this should change in the future. Bad news... Windguru forecast in style you have been used to will not be available in the near future. This is because the data from ARL NOAA server is no longer available. In the previous months there were many users using the data scripts at ARL (not just windguru website). Many of them were abusing these scripts with too much requests, windguru was always doing as much as possible to avoid this, but the others probably didn't... ARL have decided to disable external use of their meteogram scripts because all of this troubles. You can still use the scripts but only through the forms available at ARL. Windguru.cz is no more able to transform the data into "windsurfer readable" forecast tables. Sorry. I hope that I'm going to find some other data source for windguru to provide the forecast again, but it will take some time. Windguru.cz website will still continue, all the user registrations, user settings remain in hope to wake up soon. I'll try to put some usefull links to weather forecast maps here in order to provide at least some forecast for you. No more custom spots for registered users. No more AVN 191 and NGM 91 models. Some less frequently used spots were removed. Thanks for understanding... all this is necessary to keep windguru online. Added AVN Short Range model. (Available for the whole globe, resolution: 95 km). Windguru forum is now available for both registered and unregistered visitors. Changed the logging procedure a little. Now 2 situations are possible. First: you only login with your username (you do not need to enter your password), or you are recognised automatically if you have cookies enabled = in this case your username would appear in the top right corner of the page displayed in red color. If you see this, you may view all your forecasts and browse the site but can't do any changes. Second: If you want to do some changes to your settings or forecasts you need to login with your password, if succesfull your username is displayed in green color. ETA 91 model seems not to work now, I have replaced it with NGM 91. I have changed the design a little. Now the recommended resolution is 1024 x 768 and above, hope most people these days are able to use such resolution... The forecasts should now display a little faster. Recommended browsers are now: Internet Explorer 5, Netscape 6, Opera 5 and Mozilla. Now you can define windspeed modification for all the new models too. Now you can define your personal spots (only visible to you) on your "seettings" page. Then you may select them or add to your forecast pages just as the other spots. Currently, you can't use the new models for you custom spots... hope to fix that soon. I have changed the "windguru rating" system a little. Till now it worked like this: you have set 3 minimum windspeed limits for every wind direction at a given spot. Then if the forecasted wind exceeded these limits, 1,2 or 3 stars would appear as windguru rating to show how good the wind should be locally according to wind direction. Now there is the Modified wind speed - to estimate local wind you can adjust the forecast with adding or subtracting some percent (for example you set that southwest wind is usually +20% stronger than the model forecast at given location). 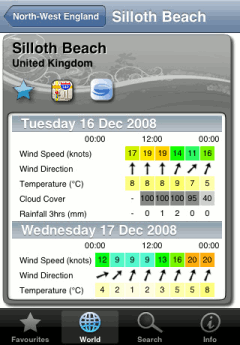 The stars as "windguru rating" are now displayed in all forecast tables and their amount is now based on the modified windspeed and minimum windspeed limits which are now the same for all spots and you may set them as you want (default limits are 11 knots for 1 star, 15 for 2 and 18 for 3 stars). Visit your user settings to manage all this. Hope the new system is more comfortable and easier to understand.